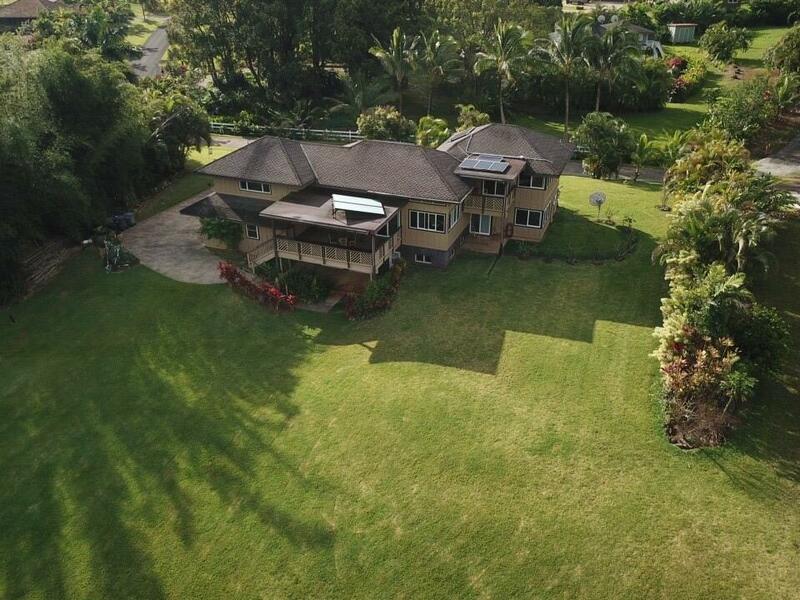 Nestled in tropical landscaping, this beautifully appointed four-bedroom, four-bath home is the jewel in the crown of the prestigious Makaleha Estates. 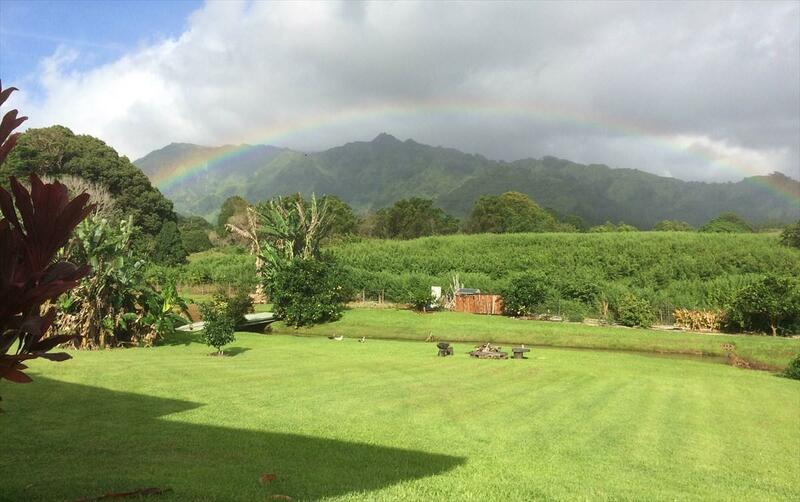 Located at the end of a cul-de-sac on 1.14 acres, this large 3000 square foot home is designed to take full advantage of the lush garden and Makaleha mountain views. 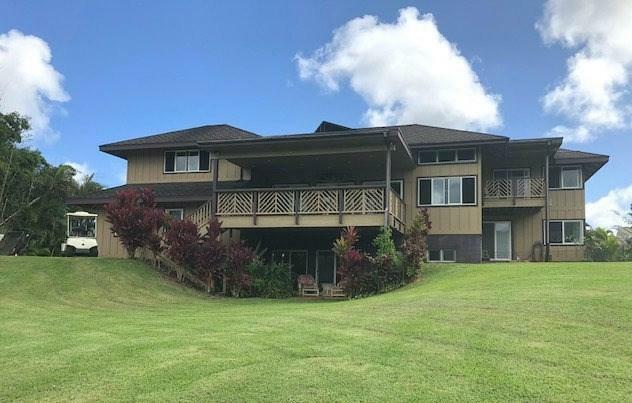 You'll enjoy seeing waterfalls and rainbows from almost every window and from the expansive lanais - more than 1000 square feet of lanai area.Designed on three levels, the entry leads you into a glass-walled, light-filled expansive great room with luxurious tiger wood flooring and vaulted ceilings. The modern kitchen offers a gas cooktop, double ovens, granite countertops and stainless steel quality appliances. The upper floor has complimenting his-and-her master suites with jacuzzi style tubs, walk-in showers, granite topped vanities, and travertine tile on the floors and walls. The ground level bedroom suite can be used as an office or art studio. The adjoining bathroom allows sliding-door access to the back yard. A separate entrance on this floor accesses a 600-square-foot mother-in-law apartment/guest space with full bath. This area also has private access from the rear of the house.This house has been meticulously cared for and the owner has devoted hours to an expansive vegetable garden irrigated by water from a small stream that traverses the property. A family of ducks wander freely among mature fruit trees that include mango, lychee, avocados, fig, orange, lemon, lime, banana, tangerine, 2 pineapple patches and more! Solar hot water and photovoltaic are also included. The 20 panel PV system is on a pre-paid lease through 2031. 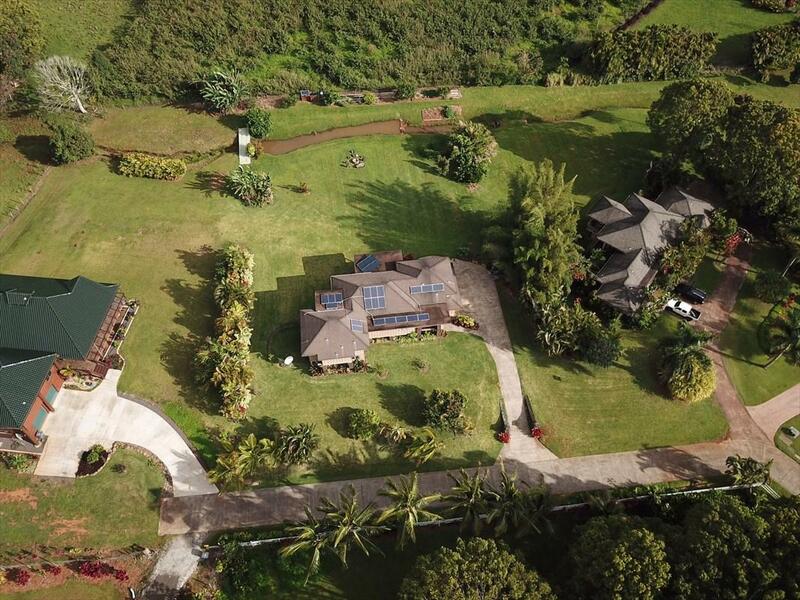 Electric bills will be so low you won't believe it!If you're looking for a private, quiet, custom home in a tropical Hawaiian setting that's centrally located to all amenities, come and view this property today!Easy to show - same day showings are possible.